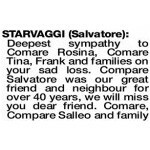 The Funeral Mass for Mr Salvatore Starvaggi of Nollamara will be celebrated in St Lawrence Church, 392 Albert Street, Balcatta commencing at 1.00pm on WEDNESDAY (27.03.2019). 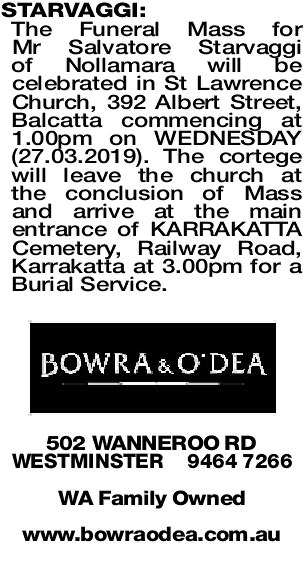 The cortege will leave the church at the conclusion of Mass and arrive at the main entrance of KARRAKATTA Cemetery, Railway Road, Karrakatta at 3.00pm for a Burial Service. Passed away suddenly on 14.3.19. Beloved Husband of Rosina. Loving Father of Frank and Tina. Loved Father-in-law of Fran and Domenic. 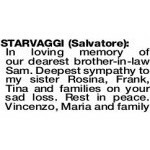 Adored Nonno of Sam, Katie, Stefan and Alessia. Riposa In Pace Funeral details will be advised at a later time. Our sympathy to Rosina, Tina, Frank and families on your sad loss. A dear cousin. 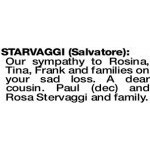 Paul (dec) and Rosa Stervaggi and family. 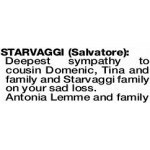 Deepest sympathy to cousin Domenic, Tina and family and Starvaggi family on your sad loss. 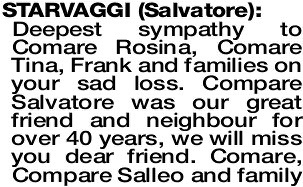 Deepest sympathy to Mrs Starvaggi, Tina, Domenic, Frank, Fran and families on the sad loss of your dear father and grandfather. 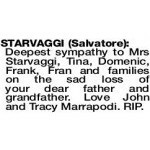 Love John and Tracy Marrapodi. RIP. 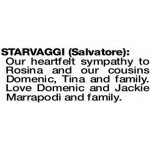 Our heartfelt sympathy to Rosina and our cousins Domenic, Tina and family. Love Domenic and Jackie Marrapodi and family. 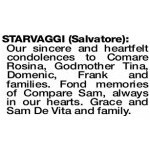 STARVAGGI SALVATORE In loving memory of our Zio Sam. A very caring and clever man and creator of many great memories throughout the years. 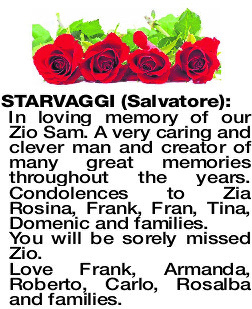 Condolences to Zia Rosina, Frank, Fran, Tina, Domenic and families. 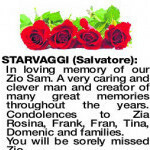 You will be sorely missed Zio. Love Frank, Armanda, Roberto, Carlo, Rosalba and families. 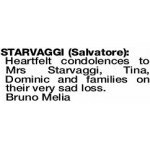 Heartfelt condolences to Mrs Starvaggi, Tina, Dominic and families on their very sad loss. 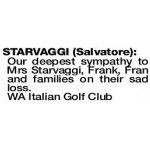 STARVAGGI SALVATORE Our deepest sympathy to Mrs Starvaggi, Frank, Fran and families on their sad loss. 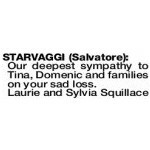 Our deepest sympathy to Tina, Domenic and families on your sad loss. 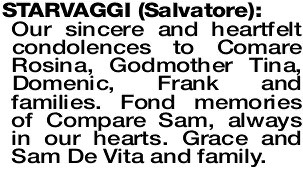 Our sincere and heartfelt condolences to Comare Rosina, Godmother Tina, Domenic, Frank and families. Fond memories of Compare Sam, always in our hearts. Grace and Sam De Vita and family.